The following blog entry is the result of a research accomplished by Me and Emdel from Playhack that received the mail and with me wrote the paper. Qui UBI è un mondo di servizi di Internet Banking che ti permette di avere la tua banca sempre a portata di mano. 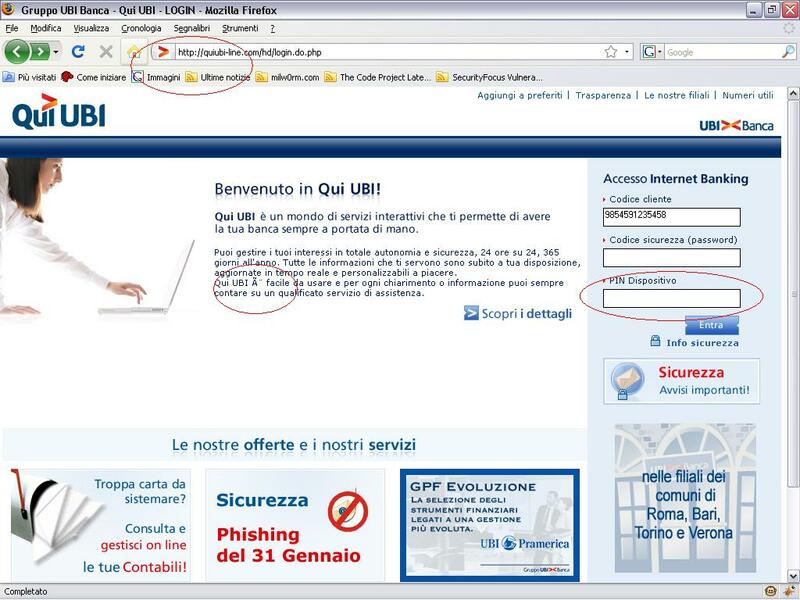 If we compile correctly the form the Credentials are Stolen and victim redirected to the True UBI Bank Website. It is from Russia! This year a lot of attacks, frauds and other kind of illicit actions were born in ex URSS and sometimes there is the RBN shadow. NtSystemDebugControl() is a really powerful undocumented function, that allows you Direct Manipulation of System’s Structures. glib 2.0-2.14.1 and precisely gmem.c at line 135 is prone to a Core Dump, that can be caused for example by a massive Cut-Pasting from threough tools like Midnight Commander. oSpy2 is the evolution of oSpy-1.9.6 coded by oleavr. With oSpy2 is possible to Spy API Activity of the selected process, you can think that there are many other ApiSpy Tools, but oSpy2 implements a well organized XML called config.xml that allows you to define the function that you want to Spy, it has also other Logging features such as dump of CPU Registers. He used as type IoControlCode and hex disabled, in this way oSpy2 not worked because he wasn’t able to recognize IoControlCode type. What to say..a really powerful tool! You are currently browsing the Evilcodecave's Weblog blog archives for September, 2008.